Windows Insiders can get their hands on another pair of universal apps after Microsoft unleashed the music and video apps into the beta version of the store. 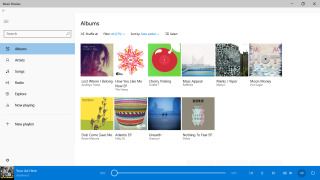 The new apps can be downloaded via the store beta grey tile inside the latest Windows 10 Technical Preview build and give users a flavor of what listening to music and viewing videos will be like inside the new OS. Music brings together all local MP3s, content in OneDrive and any music saved on Xbox Music Pass. It can then be used to create playlists that can be accessed across Windows devices, Xbox consoles and at music.xbox.com. The video app, meanwhile, gives users the power to browse and play video files in one place including any TV shows or movies bought on Xbox Video. It also lets you pause and resume content across devices. Microsoft applied Windows branding to its universal apps a little over a week ago when it brought them all under the 'Windows app" banner and they will work in much same way on all Windows 10 devices including laptops, tablets, desktops, smartphones, IoT devices and the Xbox. For the moment users cannot buy content through the beta apps, however, the Windows 8.1 Music and Video apps run side-by-side with the Windows 10 preview apps and can be used to procure content. Microsoft is encouraging users to give feedback on the two apps and is promising a range of enhancements in the coming months. This includes everything from the ability to purchase content through both apps to downloading movies and TVs for offline play.